Northeastern Minnesota’s spectacular golden birches and aspen glint under the bluebird skies of October. Gone are the sultry days of summer – the crisp days of fall and saturating colors treat with a new intensity. Lake Superior’s renewed, deep turquoise floats the 729 foot M/V Frontenac of the Canada Steamship Lines astern of the immense 858 foot M/V Roger Blough of the Great lakes Fleet. 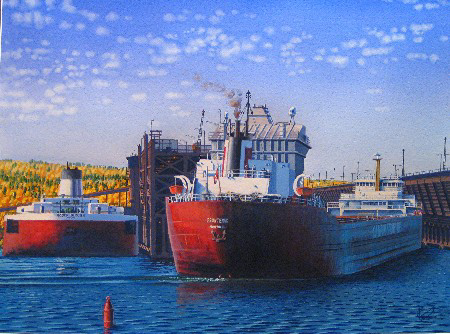 Laden with around 43 thousand tons of iron ore pellets, the Blough readies for departure from the Canadian National Railway Ore Docks in Two Harbors for U.S. Steel’s Gary Works in Gary, IN under a brilliant northern sun. The Frontenac will load around 27 thousand tons over the next 8 hours for Essar –Algoma Steel in Sault Ste. Marie, ON. As the Frontenac approaches the dock, three red-coveralled crewmembers at the forward end are readying to descend to the dock via a bosun’s chair from a forward boom to secure the vessel to the dock.